Would Kamsin Succeed in America? About a month ago, we were discussing sire-line outcrossing and a reader suggested looking into the German stallion Monsun (GER) (pedigree). At the time, the 3-year-old Monsun grandson Kamsin (GER) (pedigree) was a group III winner -- a solid runner but perhaps not one who had yet earned international acclaim. He was still several weeks away from his biggest victory to date, the July 6 Deutsches Derby (Ger-I). The exact reader request was that sooner or later, you will have to do something about Monsun and/or the Surumu line. Well, Monsun's sire line is a solid one and Surumu (GER) is his broodmare sire; they're both worthy of some attention. But now that Kamsin has grabbed the brass ring, the reader's suggestion seems prescient. Kamsin, a son of the Monson stallion Samum (GER), is inbred 4 X 3 to Surumu. My colleague Avalyn Hunter wrote a terrific analysis of Kamsin that delves into the particulars of his pedigree -- read it here -- so I will avoid doing a lesser job here and will instead consider the second part of the reader's comment: Buy a good son and stand him in California, where they race on something similar to turf. Could this work? If Kamsin were imported to the U.S., could he contribute to a restoration of the American Thoroughbred? In her article, Avalyn discusses some of the differences of the Thoroughbred breeding and racing industry in Germany. 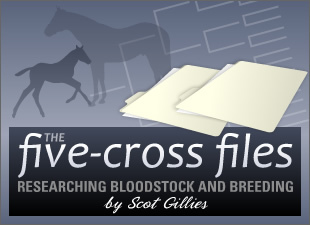 Strict rules for soundness... bred for stamina... bloodlines that are nearly absent elsewhere. Would introducing such an outcross be popular within sprint-favoring American breeders? My guess is that Kamsin would be commercially unsuccessful as a U.S.-based sire. Long-term, his bloodlines would help to restore stamina and soundness, and I'm all for that. But until American race enthusiasts are ready to make a few sacrifices -- two-furlong sprints for 2-year-olds come to mind -- I just can't see breeders here sending mares to a stallion who's likely to get late-maturing, stamina-oriented offspring. So, readers, how about it? Would you welcome Kamsin to stand in the U.S.? What type of mares would you send his way? What would it take for him to achieve success here?